The National Rifle Association pounced when former Ohio Gov. 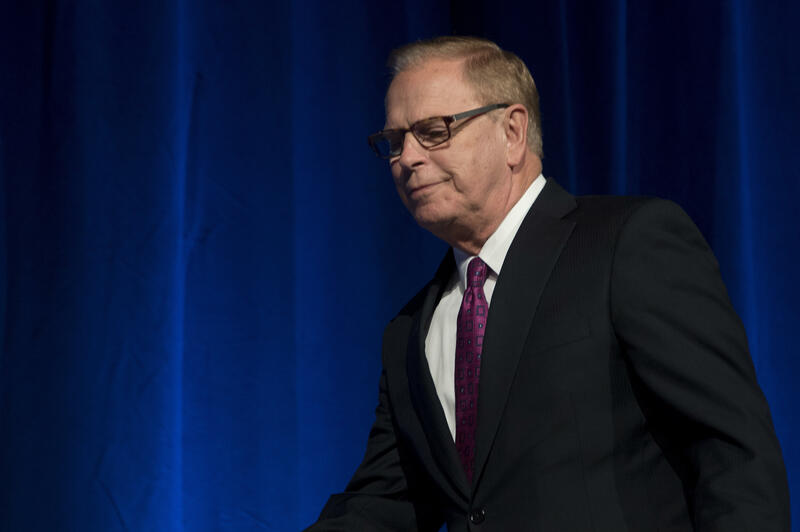 Ted Strickland, a Democrat running for the U.S. Senate, declared at an AFL-CIO event in Cleveland that the death of conservative Supreme Court Justice Antonin Scalia "happened at a good time." "That was painful," said Strickland, recalling the NRA's effort to tear down the public trust he'd spent years building. "They were out to get me." The NRA's deep pockets and bare-knuckled approach leave the impression it effectively purchases loyalty from lawmakers. But the NRA actually donates small amounts of money to candidates when compared to the large sums it spends on potent get-out-the-vote operations and ad campaigns. NRA-funded advertisements that air on cable networks and travel across the internet during the months and weeks before an election are carefully crafted to warn members of candidates that, if elected, will come for their guns. The NRA's political action committee, the Political Victory Fund, also grades elected officials on an A to F scale, a shorthand voting guide that steers members to pro-gun candidates. The Political Victory Fund and the NRA's lobbying arm spent about $52.5 million overall during the 2016 elections on "independent expenditures," according to political money website OpenSecrets.org. There's no limit on this type of campaign spending and it includes money for television and online advertising, mailers and other forms of communication designed to support or oppose a particular candidate. Nearly 70 percent of the NRA's 2016 budget was used to target Democrats, with Hillary Clinton topping the list of candidates the group sought to defeat. The rest went to backing Donald Trump and congressional Republicans who've consistently shot down attempts by Democrats to approve gun control measures in the wake of mass shootings in the United States. But pressure for at least modest firearms restrictions is heavy after 17 people were killed at Marjory Stoneman Douglas High School, which in turn raises the stakes for the NRA. Trump stunned his GOP allies last week when he sided with Democrats by urging quick and substantial changes to the nation's gun laws. Yet later, after meeting with Trump, NRA leaders declared the president and his administration "don't want gun control." The mixed messages brought action on gun legislation in Congress to a halt. The NRA donated $9,900 directly to Portman's campaign, the same amount the group gave to 12 other Republican lawmakers. Unlike independent expenditures, donations from individuals and PACs are capped for each election cycle. Portman said the NRA's money represented just a fraction of the more than $25 million his campaign raised in 2016 and he denied the gun group acquired any leverage through the donations. "I never make a decision based on a contribution," Portman said. "That's just not how you operate." The NRA's Political Victory Fund ran its first ad against Strickland in July when the Ohio Senate race was still competitive, and the 30-second spot illustrates the gun group's tactics. Strickland is portrayed as a traitor for turning his back on gun rights. "Ted Strickland. Out for power. Out for money. Out . . . for himself," the narrator said as suspenseful music plays in the background. Strickland said the NRA succeeded in shifting the impression many Ohioans had of him. Suddenly it didn't matter as much that he was a steelworker's son who'd grown up on a dirt road in the state's Appalachia region. Or that he was raised among guns and just a few years before the Senate race had earned the NRA's coveted A+ rating. David Niven, a professor of American politics at the University of Cincinnati, said the NRA almost certainly wanted to punish Strickland for being an "apostate" on top of ensuring the gun-friendly GOP maintained its majority in the Senate. Political action committees and other outside groups tend to sweep in during the last stages of an election, but Niven said the NRA got an early start in Ohio. "I don't think there's any question that they intended their participation in this race to send a message," Niven said. "There was something intolerable to them about having an ally turn into a skeptic." Strickland served in Congress for more than a decade until 2006, when he successfully ran for governor with the NRA's backing. He got the group's support a second time when he ran for re-election in 2010, but lost to Republican John Kasich as the governor's race centered on economic woes gripping the state. The NRA's endorsement commended Strickland as "an unwavering defender of our Second Amendment right to keep and bear arms" and noted his opposition to a 2004 ban on certain semi-automatic weapons while in Congress and his signature on an update of concealed carry laws. But that opinion changed drastically after Strickland in 2014 became president of the left-leaning Center for American Progress Action, which the NRA called a "radical anti-gun group" for proposing gun control measures. When Strickland sought to unseat Portman two years later, the NRA "reframed the race in ways that were detrimental to me," he said. Trump won Ohio by about 447,000 votes. Scioto, Strickland's home county on the border with Kentucky, backed Trump and Portman overwhelmingly. The NRA's opposition had an effect, Strickland said, but he didn't believe it was the deciding factor in his loss to Portman. Portman raised $25 million, more than twice as much as Strickland did, and won over labor unions that had once been firmly in Strickland's corner. As Strickland failed to gain traction with voters, national Democrats pulled millions of dollars in planned pro-Strickland ads out of the state more than a month before the election. The NRA wasn't the only one funneling money into Ohio. Outside groups, including those tied to the billionaire Koch brothers, spent upward of $30 million on anti-Strickland ads focused on Ohio's economy during his governorship, which coincided with the national recession. The NRA struck out in Nevada and New Hampshire, where the Democratic candidates won despite the gun group's opposition. In Nevada, a battleground state like Ohio, the NRA plowed $2.4 million into the race to stop Sen. Catherine Cortez Masto. She won narrowly. "They spent millions of dollars to try to beat me and didn't," said Masto, a former federal prosecutor who served for eight years as Nevada's attorney general before her Senate run. "It was ridiculous."